You might want to create different Docs sites for each of your products or brands. This article talks about creating and managing multiple Docs sites. Each site has a separate subdomain, which means you can have a separate custom domain for your products. You can use different logos and colors to change the look and feel of your site. 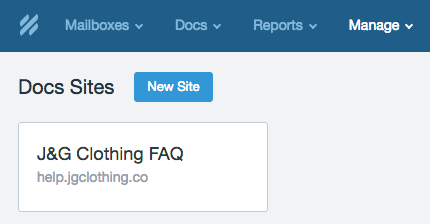 To create a new Docs site, head over to Manage → Docs and click on the New Site button at the top of the page. This is also where you'll manage your other sites if you have any. In the example image below, we have a single Docs site, J&G Clothing FAQ. You'll need to create and publish articles before your public Docs site is available. To learn more about how content is organized, see this article. To manage your collections for any one of your Docs sites, navigate to Manage → Docs and click your Docs site to open the site settings. 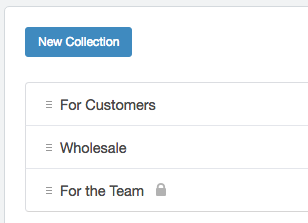 From the Collections tab located on the left-hand sidebar, you can create new collections or manage the settings for your existing collections. Your Docs site will be active once a collection is added.